I would like to convert images downloaded from the internet to JPGs with ImageMagick in VBA. So far, I've attempted two methods that have both failed. 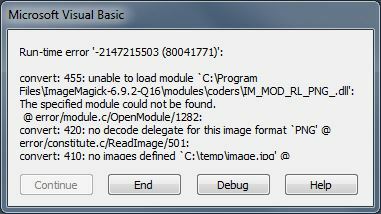 The source file ("C:\temp\image") exists, but the file that was to be created ("C\temp\image.jpg") does not. This is very similar to the question posted here, but I have not been able to find a solution to that so far. When I run this, the image gets downloaded just fine, but the image isn't converted and no error is thrown. Furthermore, when I execute the command that the Shell command executes in a separate command window, the conversion happens exactly as I would expect. So the question then seems to be why is the ImageMagick command working beautifully when it is operating in its own command prompt, but not working at all when operating from within VBA? I don't know if this is useful information or not, but I'm downloading the images from the internet programmatically, so I have no means of knowing what format I'm getting; however, the image I've been using to test this with is a PNG. If someone would like to explain how to resolve the other problem though, that would still be beneficial. Ah! That would make sense. Thanks!